It's time for another wonderful color challenge from The Play Date Cafe! This week in the Cafe we also have Kristen Powers from Kpink joining us as Celebrity Guest Designer and Sponsor! Kristen carries some wonderful Digital/Clear and Hand Carved Images. Aren't the colors Mona picked lovely! The cute coffee cup on my card is one of Kristen's Digital Images. Since I don't own Copics, I printed it out on Watercolor Paper, then quickly embossed, so I'd be able to color. All coloring with the exception of the coffee in the cup was done using the Marker Watercoloring Technique. For the coffee I used Creative Inspirations Paint in Mocha, I thought it would be a good look for coffee. The sentiment is from the JustRite What's Brewin' Set. Keeping with this weeks Color Challenge, my background paper is from the Wisteria Basic Grey package. The card stock color is actually Perfect Plum, in my photo it's more Lavender. We've had quite a few days of constant rain, thus making my picture taking a bit off. 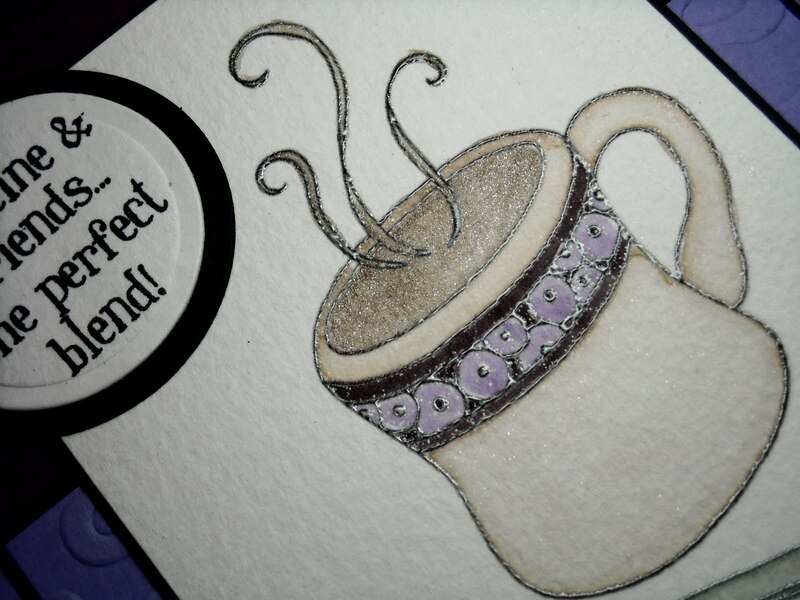 I embossed the Plum strip with the Sizzix Cheetah folder, I thought it coordinated well with the decorations on the cup. I did attempt to add color to the digital image in Paint Shop, but since the was new to me, it would have taken me forever to get the color and shading added. 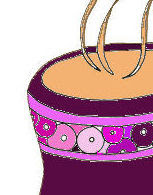 Here's a peek at my digital coloring attempt using Paint Shop. If you use Digital Images, how do you add your coloring? Thanks so much for stopping by, we'd love for you to play along with this weeks challenge at The Play Date Cafe, you can find all the details here. Lovely card. Beautiful effect on they delicious looking coffee. Love how you used the digi image from Kristen! You made such a great card with "my" digi image :) it's perfect! Beautiful coloring on that diggie image. Lovely creation, Lisa! Your watercoloring is so beautiful! Fabulous watercoloring!! What a great card! You have a beautiful blog and did a awesome projects. I love the wedding theme.. I want to did some like this wedding favors... Look Elegante and Fabulous! !